If you are planning to expand your marketing campaigns across the South African market, Blue Mail Media’s South African Business Mailing List can be the competitive advantage you are looking for. We provide marketers with highly accurate and reliable South African Business List that enables them to reach numerous C-Level Executives, key decision makers and professionals working across wide ranging industries across South Africa. Blue Mail Media’s team puts in immense hardships in accumulating qualitative data from authentic sources, verifying data for accuracy, and updating the same on a periodical basis with latest data, so that you achieve the most out of your marketing initiatives. Using Blue Mail Media’s South African Business Executives Mailing List, you can reach out to your target market without passing through multiple gateways in the chain of communication. 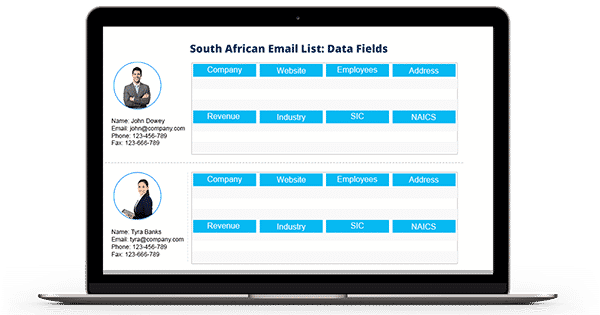 Our list of South Africa Email Database aids your sales and marketing teams with complete access to marketing information to reach out to their B2B prospects via telephone, email or mail. Blue Mail Media follows a stringent data accumulation, verification and update process to ensure you achieve higher response as well as conversions. Also, we do not serve all organizations with a one size fits all approach, and offer our clients to choose from our pre-packaged South Africa Email Address Database or get a customized list based on their campaign specific requirements.